What It’s About: After a long period in America, prodigal son Larry Talbot (Lon Chaney Jr.) returns to his father Sir John’s (Claude Rains) estate in England. All is well until, on a date to a gypsy carnival with Gwen Conliffe (Evelyn Ankers), Larry is attacked by what he believes to be a large wolf. Larry kills the “wolf” with the silver headed cane he bought from Gwen’s shop, but when the scuffle is over Larry finds he has killed the gypsy fortune-teller Bela (Bela Lugosi). Soon Larry is having strange dreams about transforming into a Wolf Man and people are turning up dead. Is Larry really a werewolf, or is he losing his mind? Why Watch it Today? 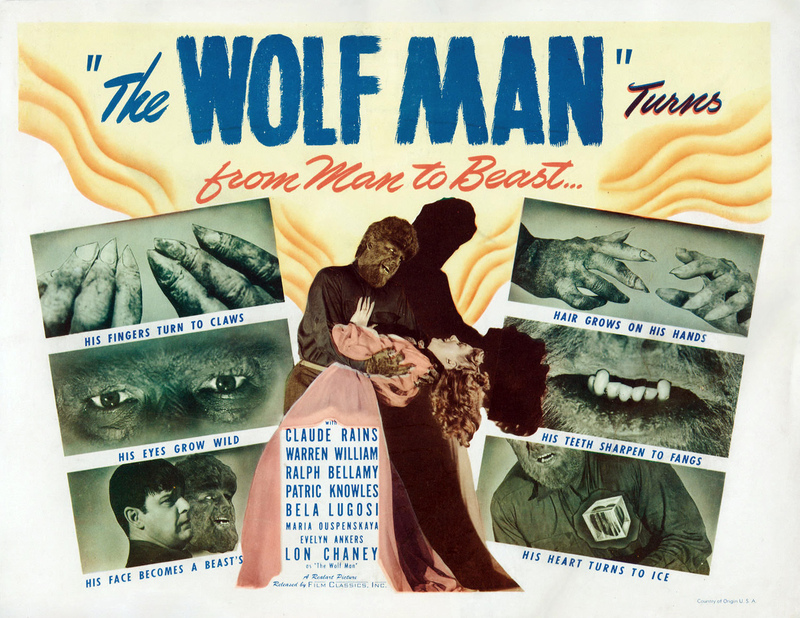 : Tonight is a full moon, and, as the famous couplet from the film states “Even a man who is pure in heart and says his prayers by night, may become a wolf when the wolf bane blooms and the autumn moon is bright.” The Wolf Man is the best of Universal’s 1940s horror output, one of the rare cases where Lon Chaney Jr.’s schluby, passive persona works with his character, a man who becomes a monster through a chance encounter (although, true to Hollywood horror of its era, he did take an engaged woman out on a date, violating a sexual taboo). The forest locations, signs that foretell dooms, and the gypsy background players, especially Maria Ouspenskaya’s Maleva, create atmosphere as thick as the fog which covers the woods, and Rains imparts the necessary seriousness to make the tragic aspects of the tale work. A perfect film for a moonlight autumn night. This entry was posted in Black and White, Horror, Movie of the Day, The Original, Werewolves and tagged "are they mad or...", "England", autumn, Bela Lugosi, carnival, Claude Rains, curse, Curt Siodmak, Evelyn Ankers, father, George Waggner, gypsies, Jack P. Pierce, Lon Chaney Jr., Maria Ouspenskaya, pentagram, prodigal son, Ralph Bellamy, silver kills the monster, The Wolf Man, Universal Pictures, wolfsbane. It still makes me laugh to think I made an entire culture up based off two characters and a couple of names from this film. (Though to be fair former movie of the day Black Cat, White Cat was partially responsible).